Time to switch to environmentally friendly cars! Taking a drive on a Sunday afternoon has been a favorite pastime for generations. 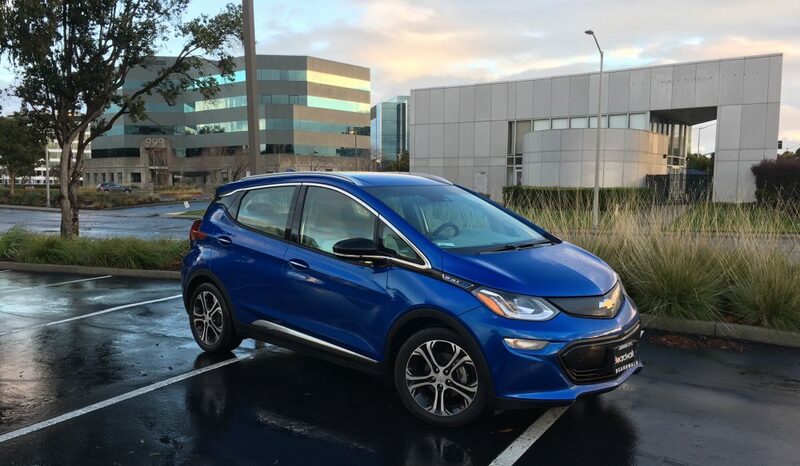 It’s extra special, though, in a Bolt EV, particularly along the beautiful roads of California’s Marin County. Yesterday, my wife and I jumped into my nearly-fully-charged Bolt (233 miles, with the A/C on), and headed north and west. Of course, the first part of the trip was pure freeway, so we listened to Sirius XM on the Bose stereo and cruised along. Once we got over the Richmond/San Rafael Bridge and onto Sir Francis Drake Blvd., we turned off the tunes and began winding our way along the scenic back roads. There’s a section that flows through the redwoods, and that’s an especially memorable experience in a pure EV, where there’s no engine noise or vibration to distract you. We stopped at Point Reyes Station, where we ate lunch in a favorite spot, the Station House Cafe, and then browsed the Point Reyes Bookstore and art galleries, where we bought new treasures–and even ran into an old friend. Behind the stores are open spaces like this. When we decided to continue to Bodega Bay, we asked Siri to take us there. He (my wife’s Siri is a British man) told us it would take two hours (we didn’t believe him) and directed us an unfamiliar way. Lucky for us, we kept going, because we ended up along the narrow little peninsula between Tomales Bay and the Pacific, in a place we had never been before. After cruising silently for several miles along some rather bumpy roads, past some huge bulls (each alone) and some groups of cows, we passed the dairy itself, and finally, pulled up at McClure’s Ranch, which consisted of a few work buildings, a house, and a path to McClure’s Beach. We drove down to the beach parking lot to use the advertised facilities and looked at a trail heading down towards the ocean. When folks coming up the McClure’s Beach Trail seemed unwinded–and not big-time hikers–we decided to walk down there ourselves. We were rewarded with splendid views and the incredible quiet of total escape from modern toys–other than the phones we pulled out to photograph our surroundings. Here’s a shot from the trail on the walk down. And after a fairly short, but mostly downhill climb, we arrived at the beach itself, overcast but not cold. On the beach, we found this amazing giant piece of driftwood. On the way up, we saw a herd of tule elks, for whom that area is a protected refuge. We even heard the bellowing voice of the male, with his huge set of antlers. A couple of miles along the trip home, we came upon the herd, where my wife shot this photo, right from the car window. What a great trip in my Bolt EV. After the drive back, I still had almost 100 miles left, too. This trip wouldn’t have been possible in an old low-range EV, and it surely wouldn’t have happened if we’d taken the short way instead of letting Siri give us the directions. Some photos above by Joy Schaefer, the rest by the blogger.